a substance, such as paint, applied to a surface as a base, sealer, etc. (in blasting work), part of an explosive charge that is provided with a detonator or a demolition cord and is designed to detonate the principal charge in a shothole, drillhole, or chamber. Primers are generally made in the form of cartridges. As starters for low-sensitivity explosives (ammonium nitrite fuel oil and various types of granulite) primers are also used in the form of demolition blocks made of Tetryl, trotyl, or a fusion of the latter with cyclonite. a textbook designed to teach reading and writing; a primary handbook for developing language and logical thinking in children. Illustrated primers are also among the initial means of aesthetic education. The teaching of reading and writing is accomplished by various methods (the syllabic method, the phonetic method, the “whole-words method,” and so on); the corresponding primers are written for each method. The phonetic, analytic-synthetic method, which is the basis on which modern Soviet primers are compiled, is the most feasible method of teaching reading and writing. The first Slavic-Russian primers were the alphabet-grammar of Ivan Fedorov (L’vov, 1574), the primer of Lavrentii Zizanii (Vil’no, 1596), and the similar primer of V. Burtsov (Moscow, 1634). In the 17th century the best primer was the illustrated one by Karion Istomin (1694); it contained drawings of the objects in each lesson. In the 16th to 18th centuries, primers were composed according to the letter-by-letter method. In the mid-19th century primers composed according to the syllabic method and then the phonetic method (F. Studitskii, 1846; V. Zolotov, 1860) appeared. In 1864, K. D. Ushinskii created the first Russian primer constructed according to the analytic-synthetic sound method. The New Alphabet by L. N. Tolstoi, compiled according to the so-called aural method, appeared in 1875. The successors of Ushinskii (N. F. Bunakov, V. P. Vakhterov, V. A. Flerov, and others) made a number of improvements in the analytic-synthetic sound method and in primers themselves. The first Soviet primers, compiled according to the so-called whole-words method, were replaced in 1932 by primers in which the analytic-synthetic sound method was revived (P. O. Afanas’ev and N. A. Kostin). Since then all primers have been compiled according to this method. In 1937 the primers of A. V. Iankovskaia and N. M. Golovin were approved, and in 1945 they were replaced by the primers of A. I. Voskresenskaia and S. P. Redozubov. The Academy of Pedagogical Sciences created a primer (1953) and a new standard grammar (1965) based on Redozubov’s primer. This latest grammar was the first in which the Academy of Arts and Soviet writers participated; as a result, this primer is distinguished from earlier ones by its abundance of artistic texts and color pictures illustrating objects and concepts. The Academy of Pedagogical Sciences of the USSR is conducting further experimental work on the improvement of primers. Redozubov, S. P. “Metodika obucheniia chteniiu i pis’mu v nachal’noi shkole.” Izbr. trudy. Moscow, 1961. Iankovskaia, A. V. “Bukvar’.” In Pedagogicheskaia entsiklopediia, vol. 1. Moscow, 1964.
a thin metal or plastic cap equipped with a percussion charge (mostly mercury fulminate). The primer was invented by the Englishman J. Egg in 1818. Primers are divided into percussion (blasting) caps and detonators. The percussion cap is used in small arms cartridges and artillery ammunition (in igniters and fuses) for igniting charges. The detonating cap is designed to excite detonation and is used in blasting work and in artillery ammunition fuses, hand grenades, and mines. The primer is activated by the impact or prick of a firing pin, or by fire, and requires special precautions during handling. Primers are also used in hunting ammunition. A prefinishing coat applied to surfaces that are to be painted or otherwise finished. Also known as prime coat. A short ribonucleic acid (RNA) sequence that is complementary to a sequence of deoxyribonucleic acid (DNA) and has a 3′-OH terminus at which a DNA polymerase begins synthesis of a DNA chain. A short sequence of DNA that is complementary to a messenger RNA (mRNA) sequence and enables reverse transcriptase to begin copying the neighboring sequences of mRNA. A transfer RNA whose elongation starts RNA-directed DNA synthesis in retroviruses. 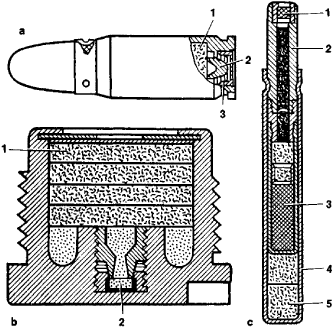 In general, a small, sensitive initial explosive train component which on being actuated initiates functioning of the explosive train, and will not reliably initiate high explosive charge; classified according to the method of initiation, for example, percussion primer, electric primer, or friction primer. 1. A paint, applied as a first coat, which serves the function of sealing and filling on wood, plaster, and masonry; inhibits rust and improves the adhesion of subsequent coats of paint on metal surfaces. 2. A thin liquid bitumen solvent; applied to a roof surface to absorb dust and to improve the adhesion of subsequent applications of bitumen. 3. A cartridge or container of explosives into which a detonator or detonating cord is inserted or attached.